Identification: Antennal clubs are blunt. 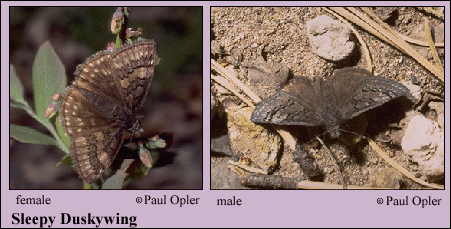 Upperside brown; forewing with 2 wide gray bands and no transparent spots. Male has a costal fold containing yellow scent scales; female has a patch of scent scales on the 7th abdominal segment. Life history: To seek females, males perch in clearings and on hilltops throughout the day. Patrolling around the host plants occurs when there is a high density of males. Females deposit single eggs on young leaves or leaf buds of the host plants. Caterpillars feed on leaves and rest in leaf shelters; fully-grown caterpillars hibernate. Range: In the west from California east to Utah and southern Wyoming; south through the mountains to Arizona, New Mexico, Baja California Norte and central Mexico. In the east from Manitoba south through southern Ontario and the eastern United States to central Florida, the Gulf Coast, and central Texas.